These itty-bitty snack breads are SUCH a home run! If we could marry a food, we'd be trying to figure out how to get a ring on one of these Snacking Rounds. Try the Banana Cocoa, Cherry Cocoa, Cranberry Orange, Muesli, and (the HG favorite) Apple Cinnamon. 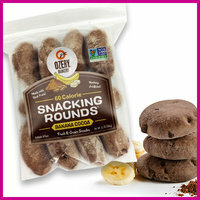 So many snack possibilities... Click to find! Potstickers are delicious, but restaurant versions are often fried and fatty. 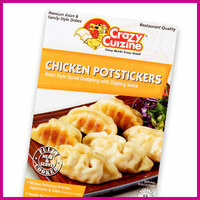 These tasty chicken dumplings are an amazing alternative! They cook up from frozen in minutes, and there’s no need to add loads of oil. (You can even make them in the microwave.) They’re stuffed with a delicious mix of seasoned chicken, cabbage, and onion... A serving of sauce only adds 10 calories, but we didn’t even need it! Locate ‘em here! Flavored sparkling water is trending hard, and we love fruity unsweetened options! There are a slew of flavors in this line. Our favorites are the Black Cherry, Summer Strawberry, and Orange! No Poland Spring in your area? It’s big in the Northeast but goes by different names in other regions. Look for this line under the name Arrowhead, Deer Park, Ice Mountain, Zephyrhills, or Ozarka... or just order from Amazon! Spread the news! Click “Send to a Friend” now.